Last week was a very hormonal week. At least looking back upon it, that's what must have caused my chemical imbalance. It surely can't be the freaking miserable grey, cold, rainy, snowy, climate that is Northern Illinois in January. I started the week off on Monday reserving a hotel room in of all cities-Minneapolis. In February?!? When I came across a post from a knitter who went to Knit out '07 and was surrounded by 50,000 knitters I wanted to go. My husband, being very supportive of my crazy knitting adventures finally said sure I'll go with you. The kids were stoked when they found out the mall has a Lego store that's 4 stories tall! As the week went on I decided driving 12 hours to a huge mall in MN in the middle of winter is really NOT something I want to tackle. I checked travel locations to all warm and sunny cities all week long. In the end my husband talked me out of every scenario I presented to him. As he stated, "Wouldn't it be better to save the $3000 for several trips this year instead of blowing it all on one impulsive trip?" Let's just say last week I felt very impulsive and would have hopped on a plane to Miami in a heartbeat! 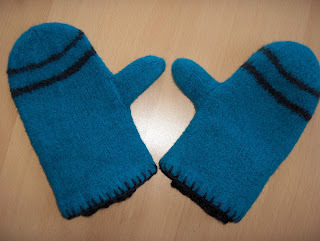 So, project wise last week I finally finished my felted mitten project. They are warm and I love the little ribbed cuff I sewed inside them. 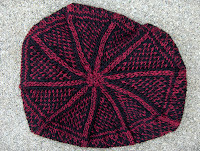 And as my husband noticed they match my center square hat I knit up last year. 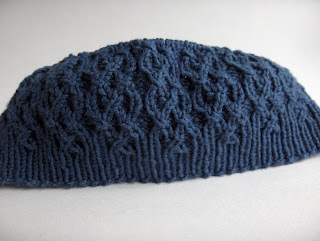 A couple of days ago I cast on for another cabled hat,Shedir. I'm considering it part of my assassin training for Hat Attack 2008! 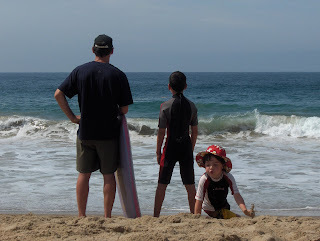 Beach Bumming with my Boys!! 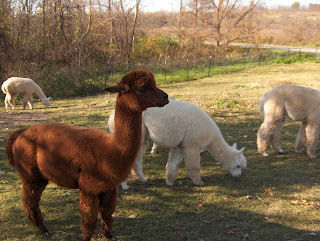 Alpacas we met during our fall trip to Galena. I tried to sign up for the ABC-Along 2008 yesterday but I'd missed sign ups by a day. I decided to go ahead and participate on my own. I'm already a letter behind as today starts the B posts. I like to see everyone's fiber filled alphabet. 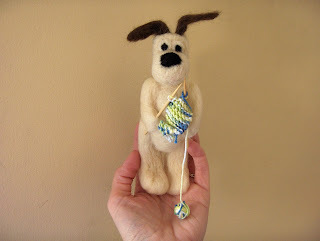 I purchased my knitting Gromit a couple of week ago from an etsy shop,Lulu's Stabby Critters. The artist resides just up the road from me in Rockford. There are so many unique and OOAK items over at Etsy. Check it out. You will probably come across something that will make you smile too. I love a good drama. I'm the first to admit I love reality shows because there is so much drama that comes out over the course of the series. But when the drama exists in my own personal life forget it. For months I've been wondering what I could have possibly done to piss my family members off. It's been a good 10 years since we've been invited to a family holiday celebration. This is ok with us because who really wants to navigate through O'Hare during the holidays. But it would be nice to feel wanted once in a while. Over the past couple of weeks the kids and I were invited to my parents winter home down south. The catch-come visit when my parents would be out of town and go home the day they return. What? As I explained to my Dad, it would be nice to spend time with you personally and not just your RV. The next odd request, to take my kids on an Alaska cruise. This would be a great opportunity but why invite only the kids. It's not like my husband or I have ever been up to Alaska. Anyway, all this freaking drama has caused me to be mentally exhausted. If it weren't for my drive to keep the kids on task with their schooling I think I could have hibernated this winter. Wake me when the sun comes out again! 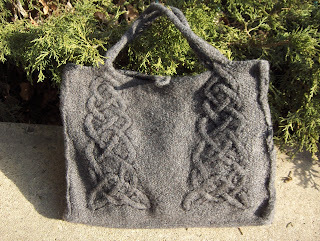 On the knitting front, I finished my celtic tote yesterday. I'd like to line it with fabric and add an inside pocket before I put it in use but at least it's all seemed and felted. I've had enough of the grey. I'm still working on my husband's grey sweater but I needed to work on something fun and colorful. Monday I headed to the burbs for a "school" function that was conveniently in the Chix with Stix neighborhood. I purchased my first skeins of Noro Silk Garden. If there's a yarn to chase the winter blahs away this may be it! I cast on a diagonal ribbed scarf yesterday and so far I love it! I was on a diet in December. A diet of chips, fries, cookies, pizza, and coffee(lots of coffee!!) My regular 3 day a week workout was non-existent too. When January came around I had to come up with a new plan for my nutrition and get back to working out. If I continued gaining 10 pounds a month I'd be camped out in pajama pants because I'd have outgrown all my jeans. For two weeks I've been on a new plan that doesn't include anything tasty like my favorite, chips and salsa. I miss all my tasty snack foods. Now on to what I've been knitting up this past week. 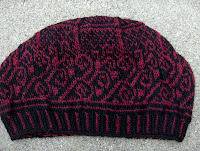 I knit up a cute fair isle hat, the anemoi hat. I chose to knit it in Brown Sheep Wildfoote Luxury Sock yarn because that's what my LYS carries. I even like how the top of the hat turned out. I'd like to figure out how to line it with polar fleece as it's very thin and wouldn't be too warm for winter weather. Sometimes I forget Ravelry isn't open to everyone and I post finished projects and details over there. Here's a couple projects I've been working on. On Saturday I finished up my Malabrigo clapotis. I love it. When I left off on this project back in October I thought I would rip it and start another project with it. I'm glad I finished it because it turned out beautiful. After blocking it on Sunday it's almost 5 feet long and still squishy and warm. If you're thinking of trying out this pattern don't choose a clingy merino wool as your yarn. 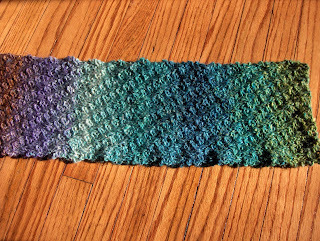 This project would have been sooooo much easier with a silk/wool blend or another yarn that easily drops stitches. I LOVE the cables! This is working up a lot smaller than I thought. I still have to felt it so this one may turn out to be clutch size when I complete it. 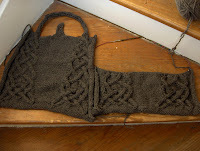 What are you working on now that holiday frenzied knitting is over?